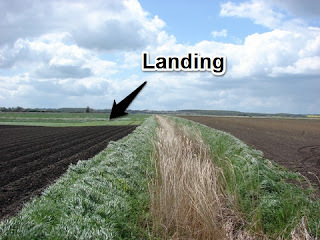 Potato field in which Josef Jakobs landed at Dovehouse Farm. I am always interested in learning more about the people involved in the saga of Josef Jakobs. The farmers who found Josef in the potato field at Dovehouse Farm have been a bit of a mystery. Harry Coulson, Charles Baldock and Harry Godfrey seem to have lived very quiet, local lives in the Ramsey/Warboys area. Tracking down information on them has been a bit of a dead-end. Last March, I wrote an email to the Ramsey 1940s Weekend committee asking them if they might be able to help. I wasn't expecting all that much but... that email has generated a few leads. In June of this year, I received an email from the granddaughter of Harry Coulson, a lady named Julia. She was able to give me a bit of information about her grandfather but, since he died when she was only 16 years old, she didn't have a lot of information. Apparently Coulson did not talk about his experience all that much, which is a shame. So much of the personal aspects of history are lost as people pass on without telling the story of their experience. Last week, I received a comment on this blog site from the great granddaughter of Charles Baldock, a lady named Hannah. That was a very nice surprise, particularly as Hannah said that her grandmother was still alive. Hannah was able to relate some of the memories of her grandmother, which were very moving and which I will now be able to share with my father, Josef's son. So far, I still have no contact with the family of Harry Godfrey, although one never knows... an email may come tomorrow or the next day! I know that our family will always be grateful to Baldock, Coulson and Godfrey for saving Josef's life. Had Baldock and Coulson not heard the pistol shots, it is very likely Josef would have died of exposure in that frigid potato field near Ramsey.